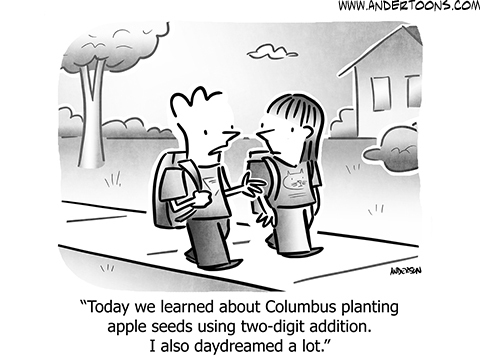 There were enough mathematically-themed comic strips last week to split across two essays. The first half of them don’t take too much time to explain. Let me show you. Henry Scarpelli and Craig Boldman’s Archie for the 15th is the pie-chart wordplay joke for the week. I don’t remember there ever being pie at the high school cafeteria, but back when I was in high school I often skipped lunch to hang out in the computer room. Henry Scarpelli and Craig Boldman’s Archie rerun for the 15th of October, 2018. Oh gads. If Jughead makes this much noise just imagining food then when he really eats he’s got to be one of those people you can hear from the next state over. I have no information about when this strip first ran. Will Henry’s Wallace the Brave for the 15th alludes to a report on trapezoids. I can’t imagine what about this would be so gold-star-worthy when I’ve surely already written plenty about trapezoids. … Really, that thing trying to classify how many different kinds of trapezoids there are would be my legacy to history if I hadn’t also written about how many grooves are on a record’s side. Will Henry’s Wallace the Brave for the 15th of October, 2018. All right, the strip is only marginally on topic. It and Breaking Cat News are the syndicated comic strips I’ve been most excited for since Richard Thompson wasn’t able to continue Cul de Sac . Thaves’s Frank and Ernest for the 17th is, for me, extremely relatable content. I don’t say that my interest in mathematics is entirely because there was this Berenstain Bears book about jobs which made it look like a mathematician’s job was to do sums in an observatory on the Moon. But it didn’t hurt. When I joke about how seven-year-old me wanted to be the astronaut who drew Popeye, understand, that’s not much comic exaggeration. Justin Thompson’s Mythtickle rerun for the 17th is a timely choice about lotteries and probabilities. Vlad raises a fair point about your chance of being struck by lightning. It seems like that’s got to depend on things like where you are. But it does seem like we know what we mean when we say “the chance you’ll be hit by lightning”. At least I think it means “the probability that a person will be hit by lightning at some point in their life, if we have no information about any environmental facts that might influence this”. So it would be something like the number of people struck by lightning over the course of a year divided by the number of people in the world that year. You might have a different idea of what “the chance you’ll be hit by lightning” means, and it’s worth trying to think what precisely that does mean to you. Justin Thompson’s Mythtickle rerun for the 17th of October, 2018. 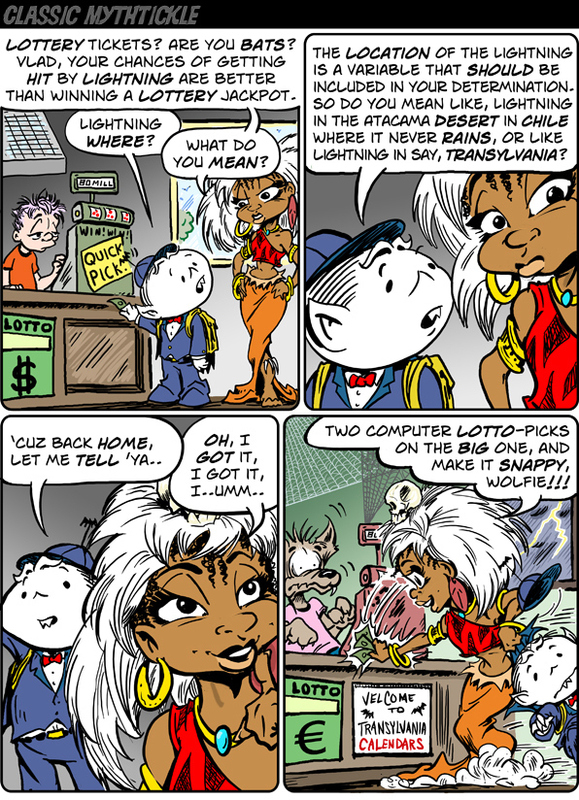 Not to step on a joke Thompson left nicely underplayed, but I find funny the premise that of course the clerk in the Transylvanian convenience store is a werewolf. I have no information about when this strip first ran. Lotteries are one of those subjects that a particular kind of nerd likes to feel all smug about. Pretty sure every lottery comic ever has drawn a comment about a tax on people who can’t do mathematics. This one did too. But then try doing the mathematics. The Mega Millions lottery, in the US, has a jackpot for the first drawing this week estimated at more than a billion dollars. The chance of winning is about one in 300 million. A ticket costs two dollars. So what is the expectation value of playing? You lose two dollars right up front, in the cost of the ticket. What do you get back? A one-in-300-million chance of winning a billion dollars. That is, you can expect to get back a bit more than three dollars. The implication is: you make a profit of dollar on each ticket you buy. There’s something a bit awry here, as you can tell from my decision not to put my entire savings into lottery tickets this week. But I won’t say someone is foolish or wrong if they buy a couple. Mike Baldwin’s Cornered for the 18th of October, 2018. What is that grit on the teacher’s desk, to the reader’s right of the pen? Mike Baldwin’s Cornered for the 18th is a bit of mathematics-circling wordplay, featuring the blackboard full of equations. The blackboard doesn’t have any real content on it, but it is a good visual shorthand. And it does make me notice that rounding a quantity off is, in a way, making it simpler. If we are only a little interested in the count of the thing, “two thousand forty” or even “two thousand” may be more useful than the exact 2,038. The loss of precision may be worth it for the ease with which the rounded-off version is remembered and communicated. If you’d like to see more Reading the Comics posts then try this link. Other essays which mention Archie should be at this link. Topics raised by Wallace the Brave should be at this link. Frank and Ernest is the subject of essays at this link. Topics brought up by Mythtickle are at this link. It’s a new tag, though, and I’m not sure there’ll ever be another use of it. And this and other essays mentioning Cornered are at this link. And do please stick around for more of my Fall 2018 Mathematics A-To-Z, coming twice a week through the rest of the year, I hope.